Melanie studied at the Conservatoire National Supérieure de danse de Paris in ballet. She danced for 10 years with the Montalvo/Hervieu company performing all over the world and was their assistant for a piece at the Paris Opera. Whilst in the Company, in November 2000, she won the "Grand Prix" at the Paris International Dance Competition as well as performing at the opening of the Cannes Film Festival. Since 2006 she has been working regularly with the Ballets C de la B first of all for VSPRS (Alain Platel) and Patchagonia (Lisi Estaras), followed by OUT OF CONTEXT (Alain Platel). In 2013 she created CODE UNKNOWN a solo dance choreography, with residencies at Mousonturm Frankfurt and CSC Bassano, performing it in extract form in London, at the London Contemporary Music Festival and premiering in South Korea at the Miryang Performing Arts Festival. Her dance piece for Young People, IT’S ALWAYS EASIER FOR THE OTHERS, was made with students from East 15 in June 2015. The piece was selected for the NOW 15 Festival at the Yard Theatre in London. In 2011, Dance in "Tout est normal mon coeur scintille" de Jacques Gamblin. In 2014, moved to London and created her first full-length solo (2014), “THREE STUDIES OF FLESH (for a female)”, supported by Arts Council England –previewed a scratch at Free to Fall (Greenwich Dance, London), FEST LIVE (Liverpool), Free to Fall (Rich Mix). Polish premiere at BRAVE FESTIVAL (12th July) and London Premiere at the FREE TO FALL FESTIVAL (6th & 7th September). This solo has been programmed for 2016 at GrotePost Ostende, and La Maison de la Dance de Lyon, and she performed the third study as part of “Saddlers Wells’ Presents” at Lattitude Festival in July 2015. She recently won the Think Big Choreography Award in Hanover (announced May 2015) and will produce a ballet with ten dancers for the Tanztheater Internazional Festival at the Staatsoper Hanover (September 2015). 2015 - Created for East15 acting school 'Us'. Research and development funding by " Arts Council England" a duet with 2 musicians of th London Contemporary Orchestra". 2016 - Three studies of Flesh at The International dance festival of Marseille. 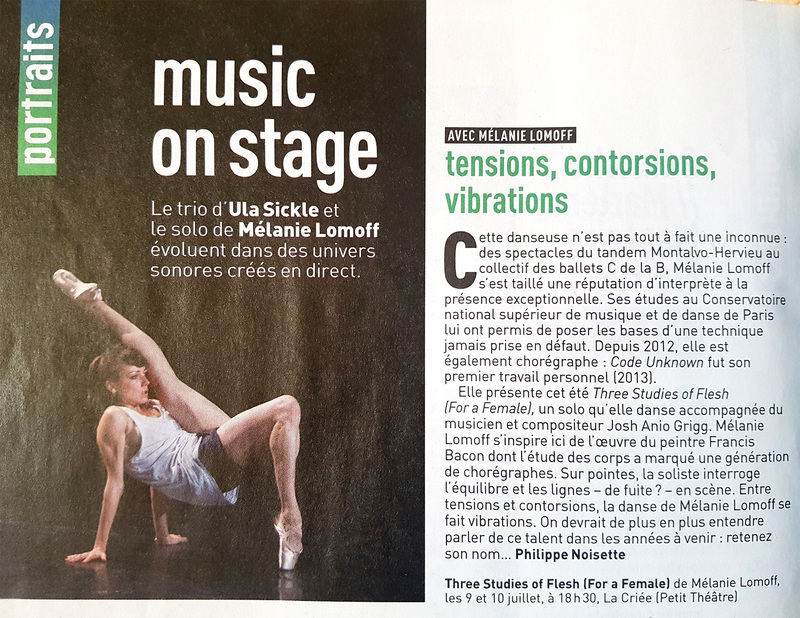 2017 - Created "Volute" pour 220v Dance Trio for 3 Dancers in Lyon. 2018 - Performe in The Opening of " Les nuits de Fourviere" Folia choreographed by Mourad Merzouki Cie Kafig. Performed and create a 5 days piece at Brave Festival in Poland.